FRAN HAMMOND (Pennsylvania) is featured for April in our 2019 Calendar. He’s a DSWA-GB Level II Certified Waller and owner of Morning Dew Stonework and Landscape, located in the Philadelphia area. Specializing in the design and construction of drystone patios, structures, and native landscapes. Fran loves the harmony that can be created with natural stone and plant material. When he’s not building with stones, Fran enjoys climbing stones, balancing stones, throwing stones, and collecting stones. 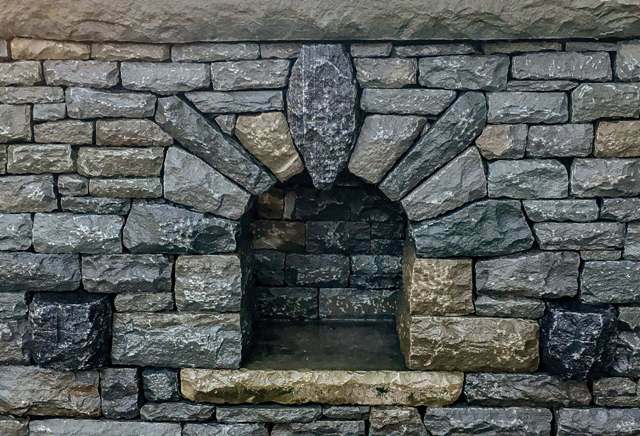 The featured image above is an arch detail of a bluestone freestanding wall. The keystone and through stones are diabase. The wall is 35 feet long and was constructed using leftover stone accumulated over several years. Below is a bluestone patio with bench retaining wall, built with Wissahickon schist stone, natural cleft bluestone slabs and weathered granite boulders. Learn more about Fran and Morning Dew Stonework and Landscape..